The sustainable development of small island developing States (SIDS) came to the forefront of the policy debate at the United Nations with the adoption of the Barbados Programme of Action for the Sustainable Development of Small Island Developing States (BPoA) at the global conference in Barbados in 1994. The question of how to effectively address the development challenges of SIDS gained further prominence in the Mauritius Strategy for the Further Implementation of the Programme of Action for the Sustainable Development of Small Island Developing States (MSI), adopted at the second global conference on SIDS in 2005. The United Nations Conference on Sustainable Development held in Rio de Janeiro in June 2012 (Rio+20) renewed the political commitment towards SIDS. On that occasion, member States reaffirmed that SIDS were a special case in light of their unique and particular vulnerabilities, demanded enhanced efforts to assist SIDS in implementation of BPoA and MSI and called for a strengthening of United Nations support to these countries. The Third International Conference on SIDS held in Samoa in September 2014 adopted the SIDS Accelerated Modalities of Action (SAMOA) Pathway which further re-affirmed that, pursuant to the various commitments made by the United Nations conferences and summits on sustainable development, there was still a need for a more integrated approach to the sustainable development of small island developing States, with the support of the international community. Additionally, the SAMOA Pathway calls upon the United Nations, the specialized agencies and relevant intergovernmental organizations, in accordance with their respective mandates to, inter alia, elaborate appropriate indices for assessing the progress made in the sustainable development of small island developing States and to strengthen national disaggregated data and information systems as well as analytical capabilities for decision-making, the tracking of progress and the development of vulnerability-resilience country profiles. 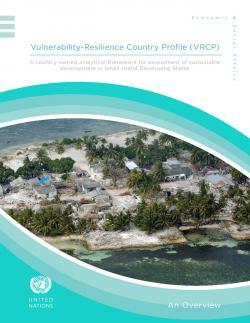 The ongoing global process to define the post-2015 development agenda and related sustainable development goals (SDGs) provides an additional contextual relevance to the VRCP process which builds on earlier work undertaken on a vulnerability and resilience index.